Manning & Napier has been guiding clients toward their financial goals for more than four decades. Our independent, opportunistic style helps investors meet a wide variety of investment needs even in the most challenging environments. Investment veterans Bill Manning and Bill Napier strike out on their own and partner to create Manning & Napier in April of 1970. In the midst of a two-year bear market with a rise in inflation, price and wage controls, and an overpriced market, we had to add real value for our clients in order to survive and grow. From the beginning, Bill Napier believed our commitment to client experience allowed us to build strong, long-lasting relationships with clients and partners, even in difficult environments. By 1983 our assets under management grew to $1 billion. Our disciplined stock selection strategies and our active management approach allowed us to manage risk through changing markets. In 1988 we introduced our first life cycle options for 401(k) plans, allowing people to pick their investment objective and delegate asset allocation decisions to an investment professional. 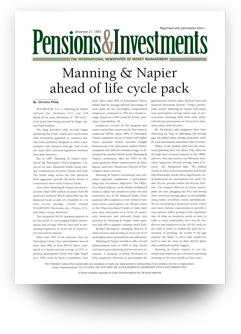 By 1993 Manning & Napier leads the life cycle pack – Pensions & Investments recognizes us as a pioneer in the life cycle space as larger mutual fund families begin to pursue the asset allocation trend. Bill Manning helps to win a 1994 court decision by the Securities and Exchange Commission banning brokers from placing their firm's interest above the financial interests of a client. “The Manning Rule” reaffirms our longstanding position as advocates for investor protection. Source: The Wall Street Journal. The article "Fund Vs. Index: A 10-Year Streak" was originally published on 01/05/2009. Our selective approach and disciplined focus on price help us avoid the excessive speculation of the historic dot-com bubble. Our clients are able to emerge from the fallout with their portfolios relatively unscathed. In 2009 Kiplinger calls Manning & Napier “an undiscovered gem,” praising our consistency, discipline, and team-based security selection. Key executives, employees, and former employees reflect on 40 years of history and look forward to the future. Manning & Napier is #1 on the Rochester Top 100, an annual list of Rochester’s fastest-growing private companies. The same year, we become a publicly traded company on the New York Stock Exchange under the symbol “MN". While we have grown and changed over the past 45 years, we remain steadfast in our dedication to clients. Whether we are helping a non-profit grow their endowment, an individual retire with dignity, or an advisor develop their practice; their goals are our goals. We are grateful for our clients’ trust, confidence, and loyalty as we focus on solutions for a brighter future. Advisory services provided by Manning & Napier Advisors, LLC (Manning & Napier). Manning & Napier Investor Services, Inc., an affiliate of Manning & Napier, is a member of FINRA.